I’m so excited to share this quilt with you! So naturally I took way too many pictures of it and put them all in this post. 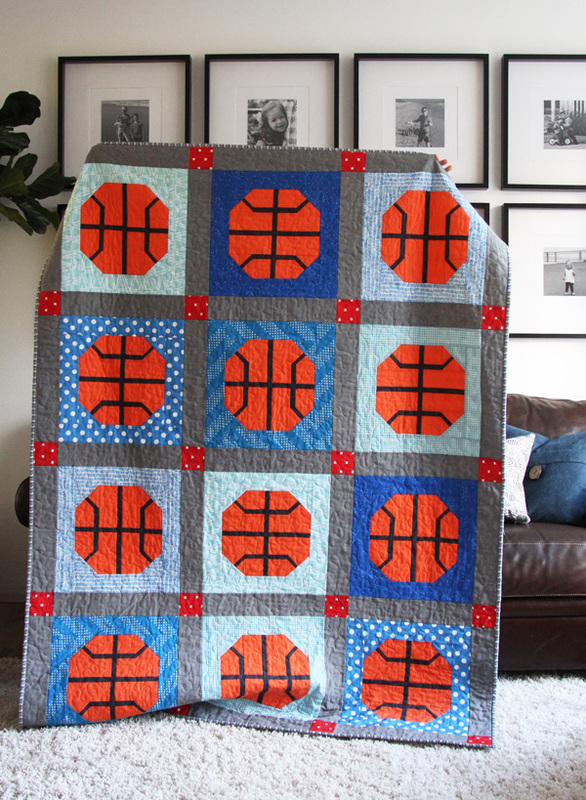 My Ryan has been asking for a basketball quilt ever since I made the football quilt years ago, and finally his basketball quilt dreams came true. This one was so much fun to make. 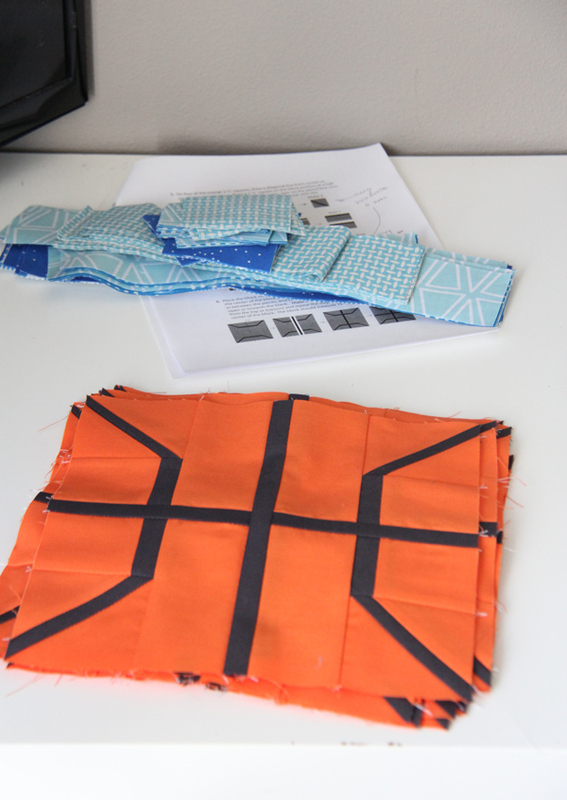 The pattern uses straightforward piecing, no templates, no paper piecing, and no tricky seams. It comes together much faster than you would expect, especially if you chain piece all the block parts at once. For the orange fabric in my quilt I used Kona Cotton in Carrot. For the black I used Kona in Charcoal (it appears black without being too harsh), and for the gray background of my quilt I used the Essex Linen Blend in Graphite by Robert Kaufman. I had such a hard time deciding on what colors to use for my quilt, but here are a few other variations that I loved. The grey and black one is still my favorite! I ended up quilting this one myself, because I made a last minute change to the pattern and had to re-make the quilt. It’s a long story for another day….but I ended up really enjoying quilting this one with an all over large stipple pattern. It’s easy to get stuck on how to quilt something like this, with large blocks that are a different color than your background fabrics. I usually recommend choosing a neutral color of thread that matches the majority of your quilt (in this case I used a light gray), and just go for it with an all over pattern. You won’t notice the quilting as much on the blocks when it’s finished…and it will be finished!!!!! 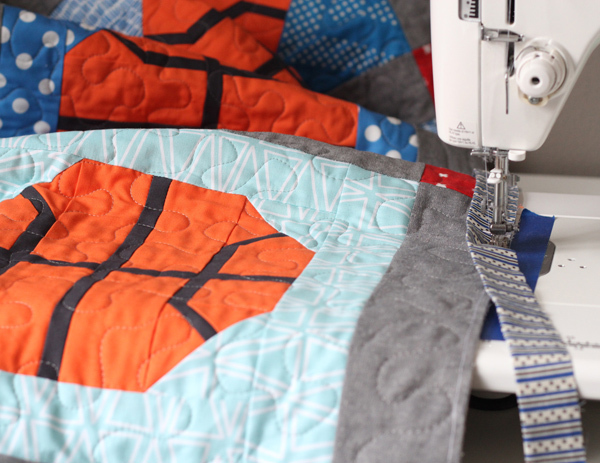 If you’re extra enthused about quilting you can also do orange in just the basketballs, then go back through and quilt the background with a different thread. 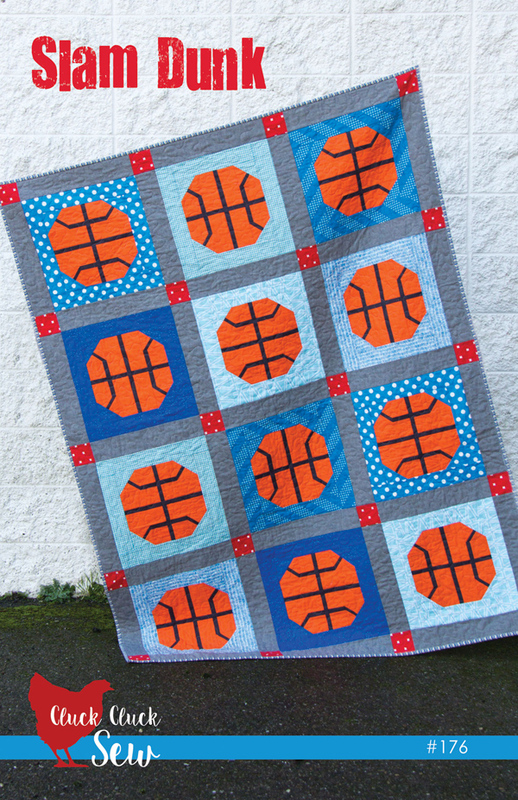 Making this quilt gave me nightmares flashbacks of playing high school basketball. I was super tall (I’m 5’11”), so the coaches thought I must be really good at basketball. Boy were they wrong! I don’t think I gained control of noodely arms and legs until my second year of college at least. I’m pretty sure my 7 year old is already better than I ever was. This pattern has been in the works for a LONG time…so I’m pretty relieved to have it done and out in the wild! The PDF of the Slam Dunk pattern can be found here, or the Paper version can be found here…and if you made it to the end of this really long post, thank you for reading it! Amazing work! You can tell he just loves it! Love! If one of my grandsons takes up basketball I will definitely order this pattern. Love it! I’ll be making this for my grandson soon (he’s 16 months old). I totally get the noodely arms and legs and lack of basketball talent – my husband is 6’7”, my son is 6’8” and neither of them is interested in playing the game because they just arent wired for that. 😊. Dribble, dribble, dribble, Swish! Wow! I love all your patterns so much. You are one of my favourite designers. I wondered if you’d do a bball one after that cool football one. You did a great job. Nice work, you are so talented! A great quilt. Your son looks like he loves it. What more could you ask for. So good of you to make it in spite of nightmares! With which I can totally identify! I’m 5’10” and could never play any kind of ball! Growing up I tried everything, soccer, volleyball, basketball, softball. Every summer I tried something new. I was always scared of the ball, and didn’t enjoy any of it! Finally, I found horseback riding and had my sport! So I never had to try anything else involving a ball again! What a relief! Looks like you are getting ready for March Madness which is really crazy here in North Carolina – Duke, UNC, NC State, Wake Forest! Super cute! I love it. I want to buy this one. I didn’t know you were tall, too! I got roped into sports like you and ended up with an injury every single season. Every one. I gave up basketball for volleyball, but still was always injured, haha. 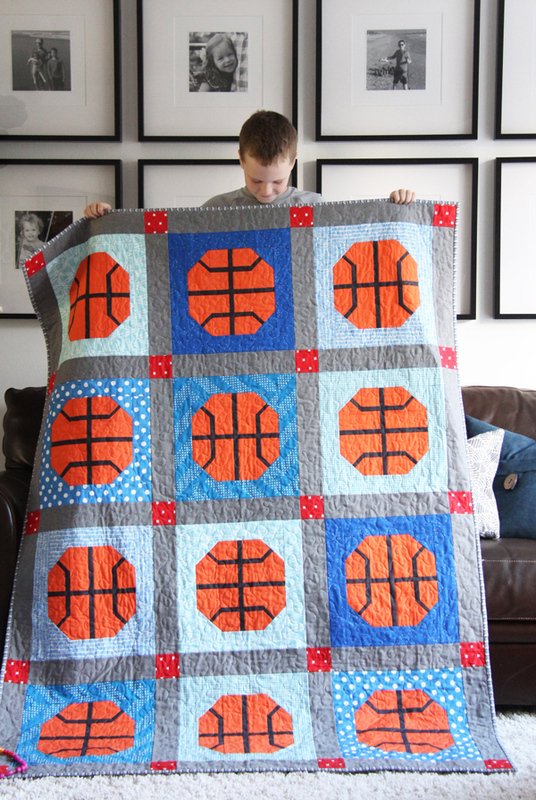 What a great quilt for your son! Me too…I was always injured and having knee surgery…which was OK since it got me out of basketball season. ;) I did love tennis though! Love this pattern. I too was 5’10 – and not the best in sports – except running relays, but was so embarrassed when my classmates used to laugh at my long legs I refused to run in any school competitions. I now regret that :)! What a special quilt for your son. You did a beautiful job of this, and I love that it is easy to piece. 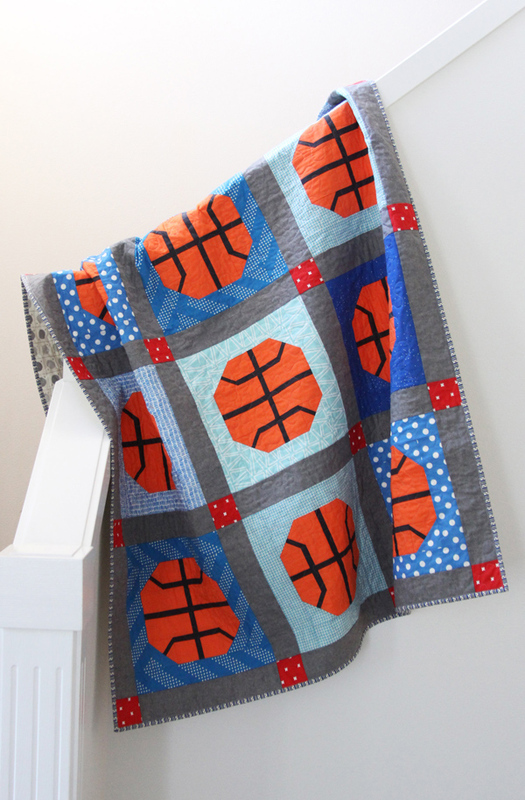 I LOVE this quilt so much……every basketball enthusiast needs one. Your background Essex is the perfect choice – I could easily live with a bolt of it. 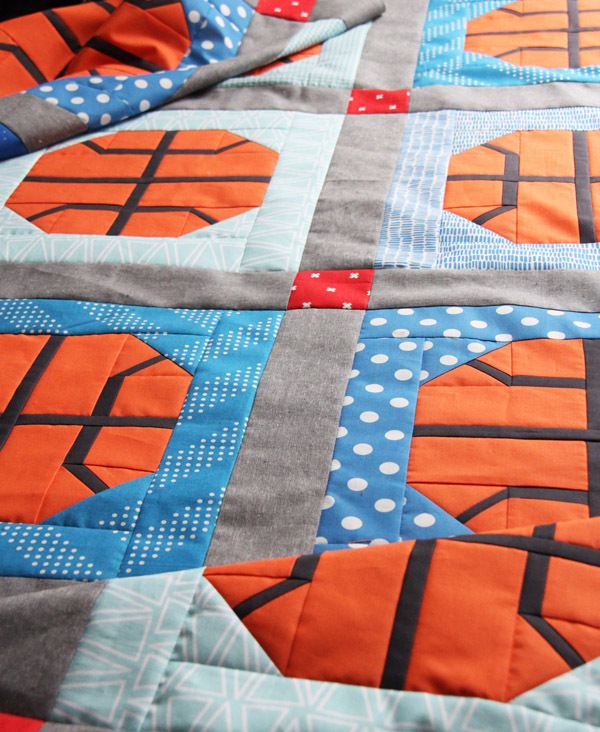 Thank you for creating this pattern….I can see lots of basketball blocks in my future! I cannot believe how grown up Ryan is! 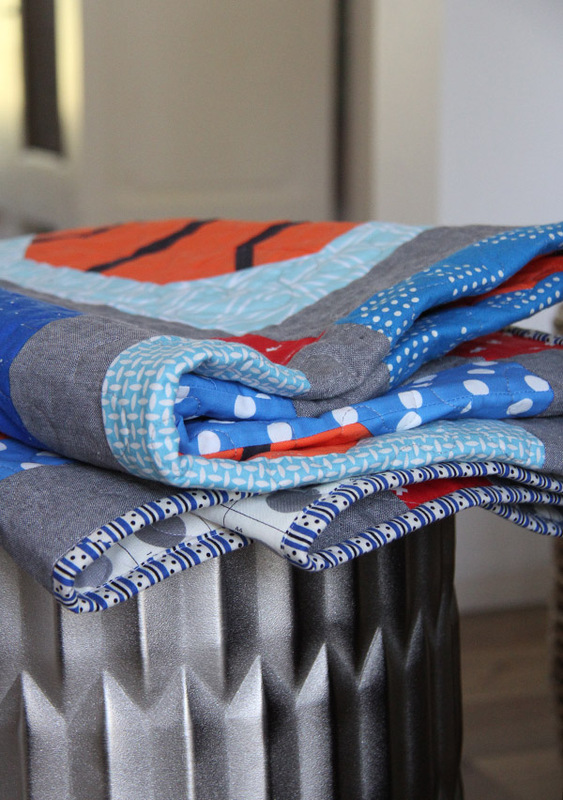 This quilt is darling… All us boy mom’s thank you! I wanted to say you hit this one out of the park ;) wrong sport. I really like how you used charcoal instead of black-and the Essex for background! One of my close friends is 6’2. She always has a difficult time finding shoes. I love love love Slam Dunk. Please design a Soccer Quilt next!. I haven’t finished the football quilt yet so I’m not showing my son this one until I’m ready to start it! :) great quilt! Love the quilt! My little guy would love this. My dad has been 6’4″ since he was 15. He was tall, skinny, and really uncoordinated but he went to a private Catholic Military boarding school and was forced to play basketball for 3 years. He hated it and it turned him off of sports in general. He was pretty much just an enforcer and laughs that he fouled out of almost every game. Great quilt! My youngest son is 6’9″ tall (just turned 20 and really hopes he is done growing). I am 5’5″. He never has liked basketball. Prefers football and boxing. Who would have guessed? Some people call it a waste. I call it his choice. This quilt is fabulous!! I purchased the football pattern for my son, but now I’m torn! I second the soccer request, although that seems impossible. Love!! Yes! It’s called Washington Depot by Denyse Schmidt. You might be able to find a little bit of it on Etsy maybe?